After extensive research and testing products, I can say with complete confidence that PolyScience is one of the best, if not the absolute best, culinary technology companies out there. They are always coming up with new and innovative technology perfect for everyone from a beginner to a professional. PolyScience creates everything from flash freezers to smokers and sous vide vacuum sealers and has won multiple awards for their innovative product designs. One of their best products is the CREATIVE Series Sous Vide Immersion Circulator. It is designed specifically for Sous vide cooking and is perhaps the most important part of it. Without an immersion circulator, your food won’t be cooked evenly and won’t turn out as succulent and delicious. I’ve found that the PolyScience CREATIVE has many great features that set it apart. It is so easy to use and is also extremely reliable so that you can ensure your food is cooked evenly and to the perfect texture. 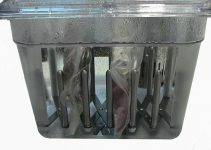 It can be easily clipped onto any pot or tank and heat up to 20 liters, or 5.3 gallons of water. The large back-lit LCD screen is super easy to read and displays both the temperature and the set temperature. It also displays temperatures in Celsius or Fahrenheit, whatever you may prefer. It is also extremely reliable in its performance. The actual temperature is guaranteed to be within .1 of the set temperature, one of the smallest margins of error I’ve ever seen and ensuring consistent results that many other immersion circulators cannot provide. The most impressive thing about the PolyScience CREATIVE is how hot it can heat water. It can heat water up to 210 degrees Fahrenheit, or 99 degrees Celsius. My favorite thing about this immersion circulator, and what sets it apart from many others, is the built in timer it has. I personally hate kitchen timers but also hate burning my food. The timer is extremely helpful and makes it convenient to use. I recommend this product to anybody in the market for an immersion circulator, and the sooner you can get it the better. You don’t need to be serious about Sous Vide to use this and is very affordable. It’s perfect for smaller portions of food, but you can still make anything your heart desires with it. I’ve had great experiences with the PolyScience CREATIVE sous vide machine and loved how it performs. I made the perfect steak with it and immediately fell in love. I’ve also made pickled vegetables, eggs, chicken, custards and even infused liquors. There’s no limit to what you can make so try it all! It’s extremely easy to find recipes online and there are also plenty of cookbooks if you prefer a hard copy. 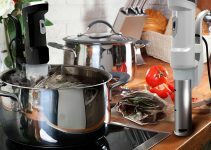 This particular immersion circulator is easy to use, reliable, lightweight, and easy to store, who could say no to that? The PolyScience CREATIVE is a favorite of mine and was even an IHA Innovation Award finalist. Not what you’re looking for? 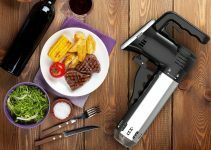 Head on over to our super comprehensive article on best sous vide machine reviews!